The fuyu persimmon is Japan's national fruit and is commonly referred to as the Japanese or Oriental persimmon. Although the persimmon fruit originated in China, the Japanese adopted, cultivated and made this fruit popular. The flesh is mild, sweet and refreshing. Persimmons are high in vitamins A and C, the trace mineral manganese and dietary fiber. Japanese Persimmon has 274 Calories and 1.38 g of Protein per 100 gram serving according to the nutrition facts provided by the USDA Food Composition Database. Though there are hybrid varieties, persimmons are divided into two main categories: astringent and non-astringent. 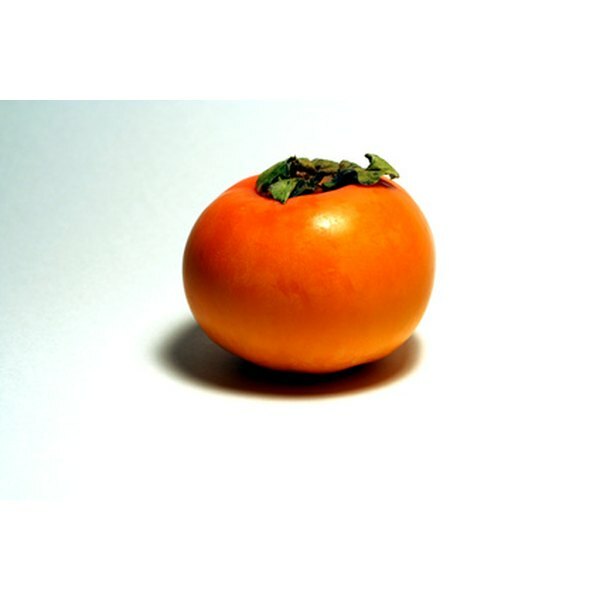 The Japanese or fuyu persimmon is non-astringent, unlike the other common type, the hachiya. Astringent, or "puckery," persimmons are very sour and can only be eaten when completely ripe. Non-astringent persimmons, like the fuyu variety, can be eaten even if hard, like an apple or pear. As a persimmon ripens, it turns from green to orange, like a tomato. Fuyu persimmons have few or no seeds. According to the California Department of Public Health, one medium-sized Japanese persimmon provides 118 calories, 0 g of fat, 1 g of protein, 31 g of carbohydrates, 6 g of dietary fiber and 2 mg of sodium. This fruit is rich in vitamins A and C. One fruit provides 2,733 International Units, or 55 percent, of the recommended daily value (DV) for vitamin A and 12.8 mg, or 21 percent, of the DV for vitamin C. Japanese persimmons are also high in manganese, a trace mineral, meeting 30 percent of the DV in one whole fruit. Vitamin A is important for healthy eyesight and support of the immune system. It also promotes normal reproductive function and is needed for manufacturing cells that line the digestive tract. Vitamin C also supports immune system function, according to the Colorado State University Extension. Both vitamins A and C are antioxidants. Antioxidants protect and repair the body's cells from damage caused by free radicals, which are by-products created when our cells use oxygen. Vitamin C helps with the production of collagen, which acts like "cement" to hold together ligaments and tendons. Finally, Vitamin C is essential for healthy gums, aids in wound healing and enhances iron absorption. The manganese you get from a Japanese persimmon plays a role in developing strong, healthy bones. It is needed for energy metabolism -- converting carbohydrates, fats and proteins into usable energy for cells -- and the formation of the principal thyroid gland hormone, thyroxin. One persimmon meets about 1/4 of your daily requirement for dietary fiber. It provides both insoluble fiber, or "roughage," and soluble fiber. Insoluble fiber promotes digestive health and regular bowel movements, while soluble fiber forms a gel in the digestive tract that binds cholesterol and removes it from the system. Soluble fiber also delays gastric emptying, helping to reduce high blood sugar, according to the National Institutes of Health. Fiber-rich diets promote cardiovascular health by decreasing levels of LDL, the "bad" cholesterol. Although you can eat a Japanese fuyu persimmon when it is hard and crispy, it will not be as sweet as when it is fully ripe. However, do not wait until this fruit is over-ripe, as it becomes mushy. The skin is edible, so you do not have to peel it, but avoid eating the seeds. Cut a just-ripe Japanese persimmon into smaller pieces and mix it into salads, or use it as an ingredient in desserts or puddings when the flesh is riper and softer. Mayo Clinic: Nutrition and Healthy Eating -- What Does Percent Daily Value Mean on Food Labels?